I have watched all of the seasons multiple times. I have my favorites. I have the moments I want to fast forward through because it's too painful to watch the story line, but I love it. I love it like I love cheese + pairings—intensely and with a passion for sharing it with others. Whenever someone asks me for a Netflix recommendation I start by suggesting The West Wing. 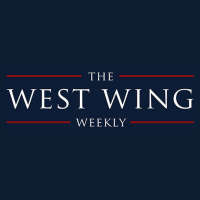 So you can imagine my delight when Hrishikesh Hirway and Joshua Malina started The West Wing Weekly Podcast! Every week these two talk about the next episode in the line up and often bring in a guest from the show or from IRL (in real life) that can talk about a specific policy or position or perspective. I've listened semi-religiously since they started and happen to know these hosts are big cheese fans so I was quick to reach out to Hrishikesh to see if we could have a chat on our podcast Curdcast, the podcast for people who like to eat cheese. Hrishikesh also hosts Song Exploder which is amazingly interesting if you even remotely like to appreciate music. So, what do a political drama podcast and music podcast host and a cheese subscription podcast host have to talk about? Well, have a listen here on our Curdcast podcast and check out what we have to say about big ideas, story telling and getting started! So many parallels came to light as we talked. Hrishikesh says about his Song Exploder Podcast "I never want the audience to feel like it wasn't for them." And we feel so similarly about the cheeses and pairings we're putting out in our box every month. We want people to feel like each box is made with the cheese lover in mind. He also mentioned that his goal at the end of every Song Exploder is for "you to just feel like making something." And you really do, if you're a musician you're like interested in making music whether it's writing your own or just playing with something you're already familiar with. If the only think you're going to make that day is dinner, you still feel inspired to look at things in a different way. This made me think about what it is we want our subscribers to do after they enjoy a box. Ideally I think we want our subscribers to feel bold about running into cheese in the wild and experimenting with pairing it. We had a little fun in conceiving how these three podcasts overlap. Do you think we got it right? Don't forget to follow @westwingweekly and @songexploder...you can thank me later. Check out our Kickstarter Campaign and snag a great deal or some "How to Cut the Cheese" Socks HERE!